Ahoy! This week the treasure is a bit text-heavy again, but no less interesting. 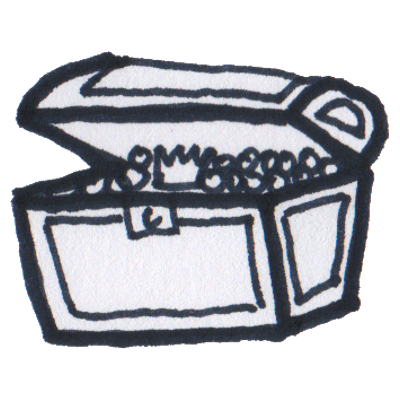 If you also want to share a nugget or even fill a treasure, please let me know viatobias@companypirate.de. Nugget #1 is about rural exodus. In Germany, metropolitan areas such as Munich and Hamburg continue to grow steadily. Real estate prices and rents are climbing to dizzying heights. On the other hand, in structurally weaker regions only the older generations remain and places literally die out. A few weeks ago I already explained how remote working can counteract this trend. On heise.de first experiences with the project digital villages are summarized. Together with the Fraunhofer Institute, communities in the middle of Germany experimented. In a first iteration, the focus was on shopping and supply. Among other things, an app was developed to implement a “bring-along” service. The second phase is currently underway and focuses on communication and mobility. Also rural co-working spaces are created. I am curious to see how quickly other regions will follow suit. If you want to know more, you can also download an ebook. I haven’t read that yet. I first came across the topic of ambidexterity in November 2017. In Nugget #2 Stephan Grabmeier introduces the topic and describes the conflict between optimizing existing value creation (execution) and breaking with the existing, experimenting and finding new solutions (innovation). It is too shortsighted ofr me to just create an extra unit for innovation. This all too often leads to organisations in the ivory tower that find many new solutions, but do not manage to transfer them into the core business and to optimize them. But I particularly like the five leadership requirements to make this a success. All too often, leadership is measured by key performance indicators of optimization. No wonder that innovations hardly flourish in such an environment. Nugget #3 is another perspective on innovation from Sue Siegel. In her article, she refers to the GE Innovation Barometer, a survey of more than 2000 executives worldwide on innovation. The barometer shows that it is difficult for companies (especially SMEs) and nations (e.g. Germany) to stay on top of innovation. However, Sue works out what constitutes the “Innovation Achievers”. This is a group of respondents for whom over 50% of the innovations had a positive effect on the bottom line. Not surprisingly, the Lean Startup method appears here again. Understand your customer’s problem and validate the buying interest as easily as possible. But even in this nugget it becomes clear that traditional business measures such as PFO fail in the area of innovation and are possibly also harmful. I particularly like the statement that partnerships will be needed in the future to innovate successfully. Sue Siegel calls that co-opetition. A perfect addition to my article on competition. That’s it for this week. I hope the nuggets have inspired and stimulated lateral thinking. If yes, how about a contribution to our “What if…?” initiative? The following questions come to my mind spontaneously. What if structurally weak regions suddenly boom? What if ambidexterity were a school subject?